Prepare this STOVE TOP Meat Lovers Stuffing for all of the meat lovers in the house. 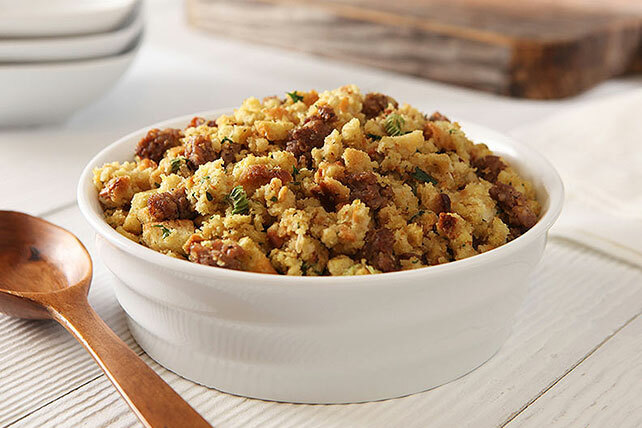 If you can brown breakfast pork sausage in a skillet, you're ready to start making this STOVE TOP Meat Lovers Stuffing! Brown sausage in skillet; drain well. Bring water and butter to boil in large saucepan. Add stuffing mix and sausage; stir. Remove from heat; cover. Let stand 5 min. Fluff with fork. Prepare using ground turkey sausage.